The Power Arm 53 Reach Mower has a reach of 5.3m and is suitable for mounting on tractors of 65hp and over 3500kg. The new three point linkage system provides better ground clearance and closer fitting to the tractor for improved weight distribution. The cushioned top link allows dual movement to absorb shock loads when travelling on uneven road surfaces, preventing damage to the machine whilst increasing the comfort for the operator. The PA53 Reach Mower is available with either Semi or Totally Independent hydraulics complete with rotor rotation control. The Hy-Power cast iron pumps and motor provide greater power to the cutting head. With the option of a 1.2m Sliding Supercut, 1.2m Heavy Duty Multicut and the 1.5m Super Multicut on the PA52 there are plenty of powerful cutting options. The control systems available are the Progressive Cable Control, Electric Switchbox Control, Mono Lever Control and the award winning Proportional Digital Armrest Control. The McConnel Easy Drive System (EDS) is also available on the PA53 Reach Mower for a much safer more efficient grass cutting. 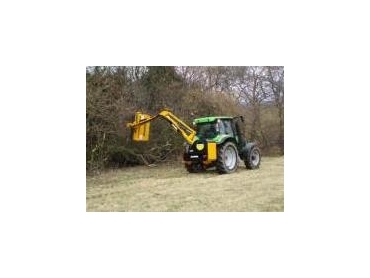 The PA53 Reach Mower is also available as a specialist front mount machine, for mounting onto the front linkage of tractors and also as a reverse drive for use on reverse drive tractors. The Power Arm 53 Reach Mower is available from International Mowers .